When I think of the Cross… The S1304 – our Bright, Cast Sterling Silver Cross with 1.5mm Inside Diameter Ring. A very tiny, plain cross – when simple is all the statement you want to make. One of our most popular religious jewelry charms. Want to hang it from a necklace so the charm is facing you? Just add another jump ring – 16 gauge or smaller will work. 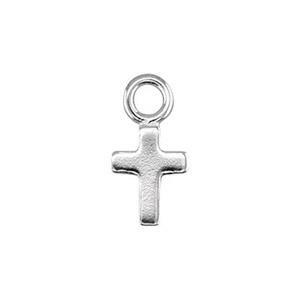 Perfect for making a dainty silver cross charm on a chain necklace for layering. I use these tiny crosses to make men's earrings. 16 gauge wire hoops with the crosses hanging from them. A favorite!